December was pretty interesting for MOTU fans. We here at IAT are still dealing with the Demo-Man fallout, since we haven’t even received notice that our payment has been processed. 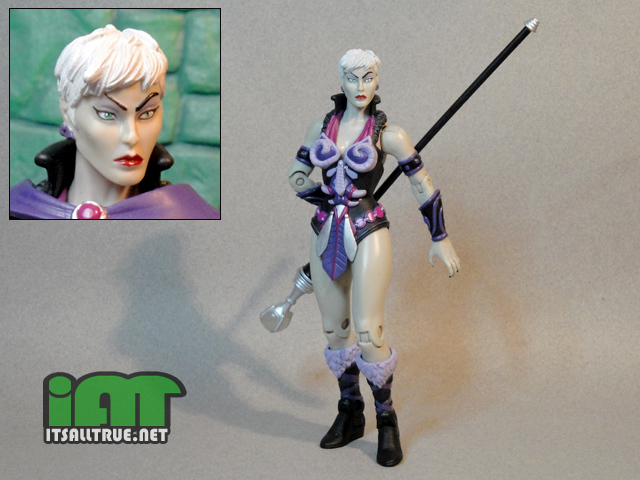 But things seem to be getting back on track with our shipment of Battleground Evil-Lyn. I’ve been highly anticipating Battleground Evil-Lyn ever since her announcement. With her increased power level and interesting back story, Evil-Lyn was probably my favorite updated character from the 200X series. Plus, she never looked hotter than when she took her helmet off and we got to see her white pixie-styled hair. 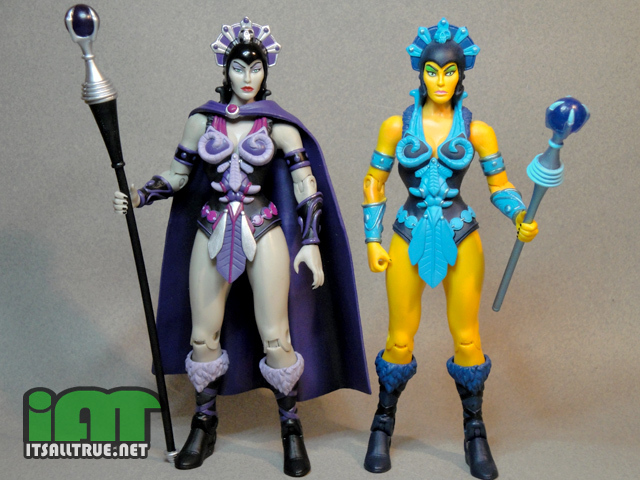 If you’ve been collecting this line for a while, you know there’s not much difference in the body sculpt from the first Teela, yellow Evil-Lyn, and the Goddess. I don’t really mind the reuse of parts for her boots and bracers. But I really wish the 4H would have given her a more 200X inspired tunic. Replacing the frilly leaves and horned piping with her spiky skeleton motif dress would have made this figure perfect. I’m not sure if we’ll ever get another Evil-Lyn variant in the line, but if we do I hope it will be inspired by her younger appearance in the MYP cartoon. This way we’d get the correct dress and possibly a new younger looking head with longer hair. Even though her body is the same, the new short haired head still looks damn near perfect on it. I love that the hair isn’t just short, but it’s also got a mussed up look to it. Maybe the short thorny locks are a bit windblown, or maybe she just doesn’t care how it looks. Either way it’s pretty cute, even if the rest of her head is giving off a murder-face expression. She also has some newly sculpted earrings, which is a nice touch. Something else they added to the body is the opened spell casting hand that originally came with Catra. I was a bit concerned when I saw this on the prototype, because Catra’s hand was made out of a very gummy plastic. Toy Guru did a good job of listening to fan complaints though, and Evil-Lyn’s hand is made out of a much sturdier material. So kudos to TG for that. The color choices for this figure are also what keeps me from hating on the clothing sculpt too much. They didn’t use an exact 200X color palette, but it’s close enough to make me happy. I actually like the added light purples and maroons on her tunic; they go a long way in helping the costume look a bit more unique. I also really like the light gray skin tone, which I think makes her look younger than the yellow Lyn. Lyn’s original head is also included. I don’t know if it’s a byproduct of having a lighter skin color, or if her eyes truly do have a different application, but her face just seems more subtly menacing. Or course it doesn’t hurt that her helmet is a nice glossy black with a metallic looking skull and plumage on top. Kind of makes me wish she had more metallics on her costume. Damn. Original Evil-Lyn almost looks bootleg next to Battleground. I don’t think I’ve heard such fan backlash about a figure that “shouldn’t exist” since Hasbro put a MASK figure in the GI Joe Anniversary line. Eh? There was a backlash about Trakker??? That was one of the best 25th figures IMO!!! Yeah. Fans complained that he was taking up a “valuable spot in the wave,” that because we got him, another more popular G1 character was bumped off. Like there was a set number of figures to be made in the 25th Anniversary line, and Trakker “stole” someone’s spot. good question Trakker was incredible! That’s really too bad there was a backlash on Trakker. I really loved the idea that they were integrating them into the same universe as Joes. Love that “prequel” pic, but I’d love it more if it weren’t for that puny Beast Man! Yeah, Beast Man is looking a bit tiny. I do wish we could have different sized characters. Another cool review as always Vault. Now here’s a repaint I’ve been waiting for for a long time. Can’t wait to get mine! She’s pretty good. I think you’ll like her. i look at this, and i try to be objective, to measure the merit of the fig on it’s own… but i keep imaging, in my mind’s eye, a bank statement sans matty charge for DM, and it makes me furious for you guys. so BGEL becomes a shadow of what she may be rights have earned, but i look at her at as the gilding on the turd. and really, as she’s still not a proper 200x translation into classics, she’s kind of turdish herself… the true 200x version would be the gilding. that said, good review, and food on you vault for not getting too drawn in to the politics of the line. i can’t be objective at all right now on this line, so clearly, you’re a better man than i. i got up to take a whiz last night and after getting back into bed, i literally lay there for about 20 minutes thinking of “ask matty” questions that would hold mattel’s collective feet to the fire a bit. how sick is that? i do get hung up on mattel perhaps more than i should, but it stems back a bit more to the broader corporate attitude that their customer base are generally sheeple who will buy compulsively so long as they keep churning out crap… and then we’re seeing a collective push in smaller business to provide more targeted goods that have an artisanal quality to them (which in toys we’re seeing mirrored in SMC and onell and companies like them) and wondering why collectively we can’t make a more conscious choice to move to those kinds of products to really hurt the abusive corporate scumbags the only place they feel pain: their wallets. I admit I haven’t read the responses from Toy Guru or the Horsemen themselves, but has either side said “we WON’T be making an accurate 200X or Filmation Evil-Lyn?” If that’s the case, then yeah, I’d be annoyed. But if it IS just a matter of “take this for now, and we’ll get around to making the other one later,” then…what’s the deal? TG did mutter something about ‘we told the 4H they could sculpt a new dress if they wanted, but they was like “whaaa?” and it was a design choice’. Disclaimer: I might be paraphrasing a bit there. 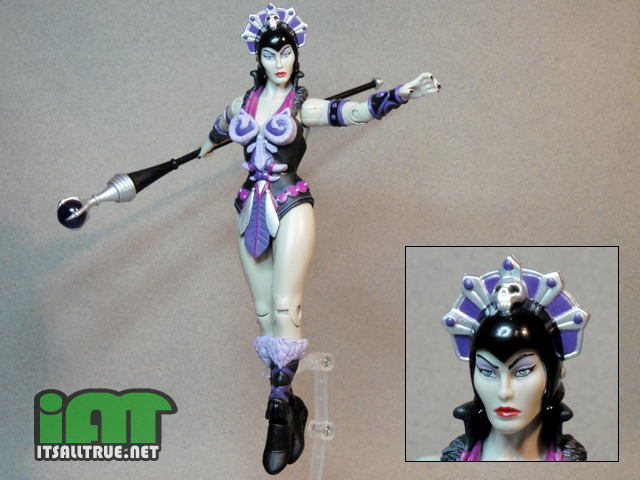 I do really like my BG Evil-Lyn, and I’d love a MO2K accurate one too, but I’m not sure I have space in my heart for all three. Of course they had to make a vintage toy version, would be crazy not to, so if a MO2K version does come along the half-and-halfness of BGEL might start to feel a bit redundant. It’s a bit like the SDCC Cringer – if we get a fully articulated version the original’s a waste of money and shelf space, if we don’t then the original will always be a missed opportunity that didn’t quite come together. Even though Demo Man is a cluster mangosteen, I can’t hold it against Evil-Lyn. Besides, I get tired of complaining about Matty’s actions. Especially since none of it seems to do any good. It’s just easier to stick with the what they’re doing right or wrong on the figures. i know dude, it’s my own personal hangup. your review was fair, moreso than i could have mustered for her. that said, like clay mentioned above, i’m just not ok w/ “kinda evil lyn.” she’s a cop out for more money, and the “blame the horsemen for the half and half” is crap, she’s a money figure, and they spent what little new tooling cash they had on her head, because they figured that would be good enough (in conjunction w/ the palette swap) to keep the mo2kers happy… and she wasn’t. the whole thing is just not my cup of tea. i can see how, for some folks, she was close enough, and that’s fine for them, i just fall on the side of the fence for whom she was not close enough. I got my shipping notice today so I may actually get my DEC order yet. Cant wait to play with BG Lyn Demo and the WR!! Good luck Doc! I don’t know if we’ve even gotten our shipping notice yet. I don’t know what kind of camera Noisy uses, but mine is a Sony Cyber-Shot DSC-W290. I totally missed that! That’s a nice addition to the figure. Thanks Logan. Alas, all the delightful new features introduced in this new figure are points of interest I would rather have had in the Original: The “spell-casting” hand, the swiveling wrist-bands, the Glow-in-The-Dark Orb, the helmet-less alternate head, the CAPE!! I really like BattleGround Evil-Lyn, but she’ll never replace my glorious Blue-clad Bright Yellow Evil-Lyn! Although I’m partial to her 200X look, I do wish these features were part of the original also. I know it ain’t 200x, but dangit, I love this figure. Hopefully Matty ponies up and gives us a true 200x Evil-Lyn. lol, yeah she’s pretty good. If they never do get to a proper 200X, I could probably live with her. Very fun and well-done review, as always! 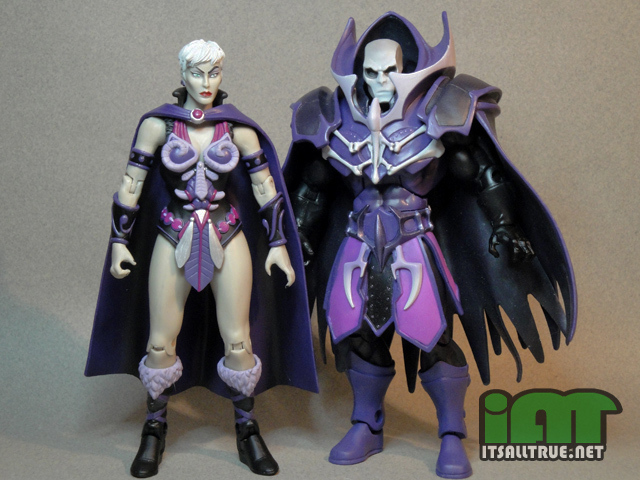 She looks pretty good, and I’m looking forward to getting her (along with a backlog of other items that have yet to reach me), but really, would a proper Millennial Evil-Lyn tunic have bankrupted Mattel? I doubt it. Or come to think of it, a longer cord on the Wind Raider’s anchor? More sacrifices to the Almighty Logistics. One question that deserves asking the Mattel crew, in my opinion: When is Region 2 going to get the rest of the MOTU / POP full-season DVD box sets?!! I’m waiting to hand over bagloads of money for anything that isn’t MOTU Season 1, and they’re not giving me the chance.